Its proper title is Arrangement in Grey and Black No 1 which doesn’t do a lot to inspire, does it? 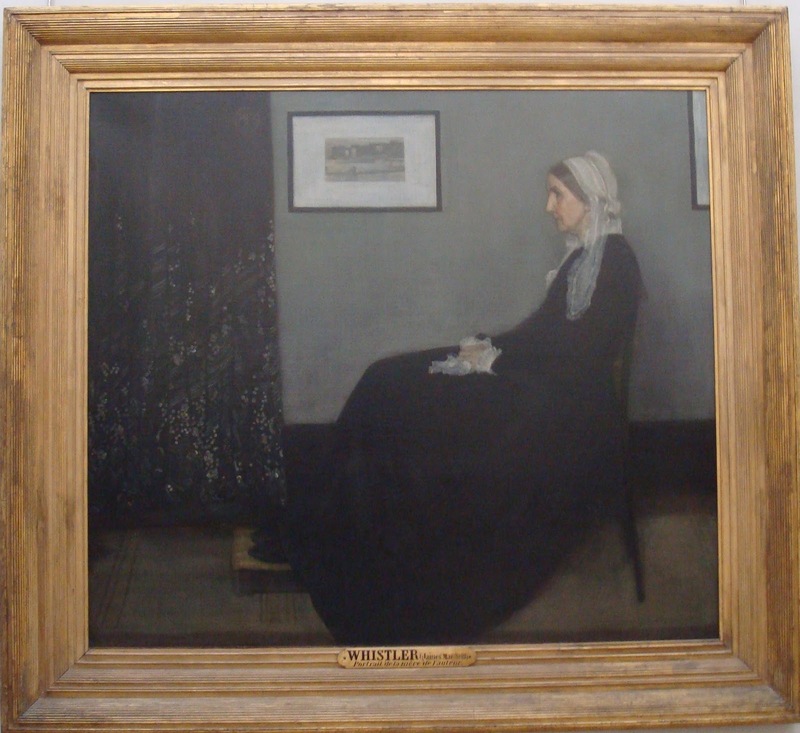 Painted by James McNeill Whistler in 1871, it is more commonly known as Whistler’s Mother. This painting has a special place in my heart because, whenever I look at it, despite its rather dull appearance, it never fails to make me smile. My son Rory, aged 11 at the time, took this photo of Whistler’s masterpiece, at the Musée d’Orsay in Paris. He stood in front of this revered piece of art and laughed his head off. Why? Because at the time Rory was a huge fan of Mr Bean and, in particular, the film, Bean, where Rowan Atkinson’s character, whilst in charge of guarding this priceless artwork, proceeded to deface it. For those who haven’t seen the film, Mr Bean sneezes on the painting and tries to wipe it clean with a hankie which, unfortunately, is covered in blue ink. The ink causes blue smudges to appear, which Bean then tries to remove with lacquer thinner, resulting in the face of Whistler’s poor old ma being completely dissolved. In the end, the cartoon mother is replaced by a poster of the painting from the museum’s gift shop and no-one is any the wiser. Rory was quite delighted to see the original painting, though I’m sure he preferred the one above. It made me realise how much fun children can experience in art galleries and museums. He saw lots of art on that holiday: Van Gogh, Picasso, Degas, Monet, Rodin….and snapped away quite happily with his trusty camera. He wasn’t at all bored. We made up names for paintings and looked for celebrity looky-likeys such as ‘Tiger Woods playing the banjo’. I remember the Bean film very well as the DVD has been played numerous times over the years. In particular I loved the ending, when Mr Bean actually strings a few sentences together and makes a bizarre but, ultimately, quite moving tribute to Whistler’s Mother. thought the world of. Well that’s what I think. I have been reading the #ArtIHeart series of posts on the blog of Midlife SingleMum and decided to join in this week. As soon as I saw the image I was thinking Mr Bean…! It will always have a cartoon face in my eyes. Ruined forever! Hooray! Thanks for joining the Art I Heart linky. I love it that an 11yo boy can have so much fun in an art gallery. I'm inspired and can't wait to take my daughter in a few years time. I so enjoyed joining in with the Art I Heart linky. I try not to do many linkies (don't like to see a blog full of them) so usually just stick to 'The Gallery'. But have loved reading your art choices and couldn't resist having a go. Have never had any worries taking Rory around museums and galleries. When he was younger he would often follow a trail of sorts organised by the museum. As he grew older we would just find a different way to engage him, including being very silly! I'm sure you and your daughter will have as much fun as we've always had. I hope you do join in, Emma. I found I had lots of ideas buzzing around so potential to enter other weeks too. Mr Bean isn't to everyone's taste but it's hard not to laugh when a little lad becomes a real fan. There's an age (about 8 to 11) when the humour is perfect for little boys. Mind you, I've always liked him too: remember the church sketch? Whenever I go back to London, especially in the summer, I try to meet up with an old university friend. He usually comes up with an idea for an outing, and one year it was a mammoth tour of his favourite artwork of that month. We dashed into the free galleries, saw the work in question which was interesting for a reason and then went to the next one, including the South Bank which had oversized armchairs and tables in grass. The boys had a great time despite not really liking to visit art galleries. I think it was the one-stop visiting that appealed instead of trailing round the whole place. I quite agree: it's the aimless trudging from room to room that frustrates children ( and me, to be honest). That's so much easier with free museums: pick a specific piece or room and spend a short time there. It's harder when you've paid good money to get in, but even then, we try and keep it interesting and at least have some sort of plan. The galleries for modern art tend to be a lot more fun: the old masters don't appeal much! Its a common misconception that his mother is sitting on a chair. 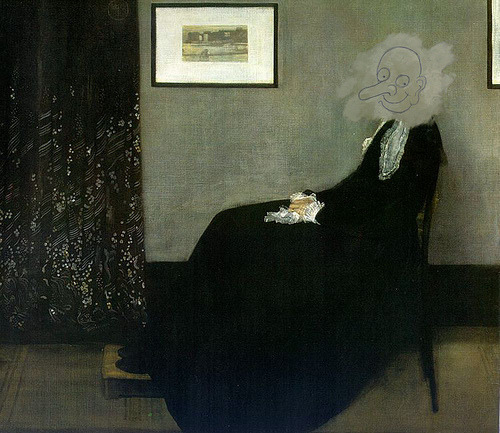 Whistler was very cunning with how he painted her long black frock. In fact she has two wooden poles propped under her shoulder blades and her feet are on a wooden block. He captures well her concentration as she fears any movement will cause her to fall. Analysing art is easy when you know how. I read somewhere that princess Margaret used to take her children to a gallery or museum to see one beautiful piece and then leave. Apparently the idea was to leave them thirsting for more. I can't honestly Imagine that it would have had that effect on my offspring. They would probably have legged it out of the gallery crying "thank God that's over! Now can we go to McDonalds?" Philistines! Princess Margaret and Sarah (commenting above) had the same idea.